So what's it all about? The movie is an entirely redundant Peter Pan sequel. Or rather it feels like the first half of one. Peter is a young orphan left with some rather sadistic nuns in a gloomily lit world war two London of food rationing and German bombs. 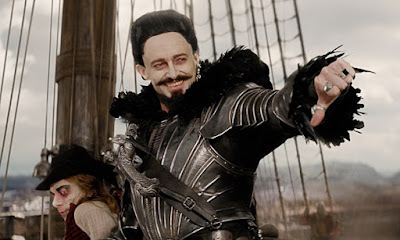 One night he is captured by a flying pirate ship captained by Hugh Jackman's camp but angsty Blackbeard and taken to the spice mines of kessel, sorry, the pixie-dust mines of Neverland. Enslaved, Peter makes friends with a character that's half Indiana Jones- half Han Solo called, wait for it, James Hook (Garrett Hedlund)! We know Peter is going to lead a slave revolution because, hey, he can fly and his mum's called Mary! So together Hook and his sidekick Smee he nicks a ship and flies to fairyland with his new friend Tigerlily (Rooney Mara). She's a kickass girl and clearly the writers are trying for some kind of Han-Leia relationship with the rogueish Hook, complete with a last minute rescue reminiscent of A NEW HOPE. Anyways, there's then some Moria-ish stuff about fairy writing and a key and some Harry Potterish stuff about a childhood crush gone wrong and you end up just wondering why Blackbeard didn't just kill Peter when he had the chance. PAN has a running time of 111 minutes and is rated PG. The movie is on global release.